In an unusual convergence of Olympic sports, cryptocurrency, and 90s nostalgia, the Jamaican bobsled team is Dogecoin's biggest hero this week. The team turned to the joke currency to raise money for its trip to the Sochi Olympics and, in doing so, raised the Dogecoin to Bitcoin exchange rate by 50 percent in just 12 hours. The strange ride started on Sunday when news broke that the Jamaican bobsled team had finally qualified for Sochi and would be headed to the Olympics for the first time since 2002. They only problem was they didn't have any money. The two bobsledders, Winston Watt and Marvin Dixon, first put up their own money and then turned to PayPal for donations. Liam Butler, head of the Dogecoin Foundation, caught wind of this and thought he could make a difference. 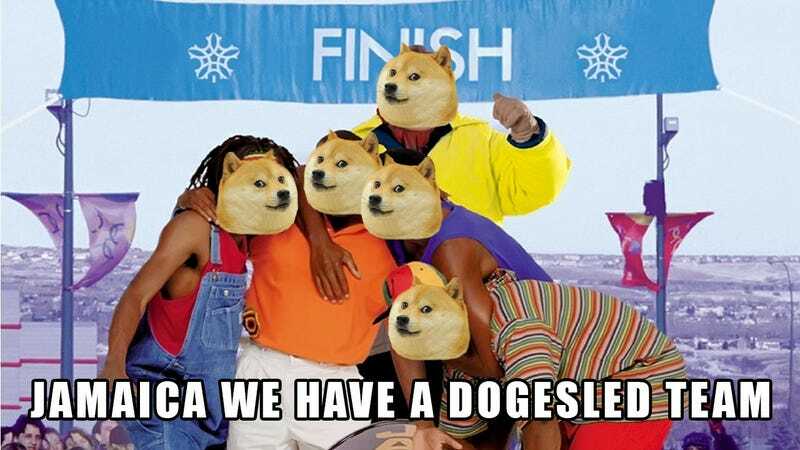 Thus began the Dogesled campaign. Butler says he "sent a few emails out" and the donation started pouring in. Redditors in the Dogecoin subreddit also chipped in to build buzz about the campaign, and, by Monday morning, the Dogecoin Foundation had about $25,000 ready to send to the Jamaican bobsledders.